The novel opens with a tennis match between the pair - Eli, who serves as narrator, and Sam Westergard, who didn't really fit in their graduate course in Marxist theory. McIlvain, from Eli's view, writes, "It didn't feel quite right that Sam should be there in the first place - Sam Westergard, clearly fish out of water in our graduate course in Marxist theory. He didn't look the part, anyway. He wore stretched-out polo shirts to class, or old road-race T-shirts, an almost constant smile. He intrigued me. On the night Sam showed up in an oversize Roger Federer shirt, I rustled enough to pay him my complements on it. I was a fan myself. 'Hey, really? Hey, cool,' he said, with startling enthusiasm. "Pretty soon Sam and I were playing tennis together most Friday mornings and whenever else we could get away from the city and classes, the teaching, underpaid, the life, underpaid. Tennis was a balm and acriucible all at once. Tennis was a balm and a crucible all at once. We each wanted to win, obviously, very badly, but we also wanted to maintain the illusion that our 'practice sets' were only that - a little practice, a lark, a pair of pale intellectuals disgracing the game with our play...It wasn't an easy false premise to keep up: The sweat started pouring off me usually in the first game, or else I'd notice Sam's jaw, strangely squarish for his face, jutting out like an old cash drawer after he sent a ball into the net or sailing long. I started calling him Lockjaw. Or Little Lockjaw - a reference to his tall, lordly stature. I probably didn't know Sam well enough to joke with him like this, not at first, but what else could I say? I couldn't have known I was standing across the net from a murderer, and neither could he." Once this fuse is lit, McIlvain steps back and explores in fiercely intelligent, effortless prose, the nuances of friendship and love in the lives of these characters. Eli and Sam, both graduate students, quickly bond over their idealism, their love of poetry, and their commitment to social justice, with the last one taking the form of an organized protest against Soline, a giant energy company that has speculated away the jobs and savings of thousands. As an Occupy-like group begins to coalesce around Eli, he realizes that some of his fellow intellectuals are more deeply, and possibly dangerously so, devoted to the cause than others. 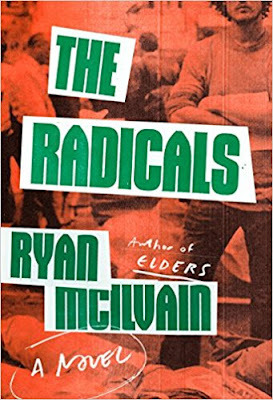 The Radicals will resonate with politically minded readers of fiction and nonfiction alike. The themes of wealth, inequality, class tension, activism, and anti-establishment passion will be familiar to anyone who has followed the news in the past few years. In terms of style, this book takes its place in contemporary literary fashion with a keen intellect and big heart, along with The Art of Fielding, Billy Lynn's Long Halftime Walk, and Let the Great World Spin. The Radicals is a sharp, wonderfully human illustration of friendship, empathy, and suspicion in the midst of political upheaval. McIlvain showcases his rare talents as a storyteller and stylist, and confirms him as one of our most gifted young writers. McIlvain grew up in the Mormon Church and resigned his membership from that organization in his mid-twenties, well aware of the risks of excessive zeal. His first novel, Elders, grappled with faith in startling ways and sparked many discussions. The Radicals, which is entertaining and thought-provoking, is sure to do the same and get people talking.